Our children grow up so fast! Take time out TODAY to be photographed with your child! These photographs make really special gifts!! 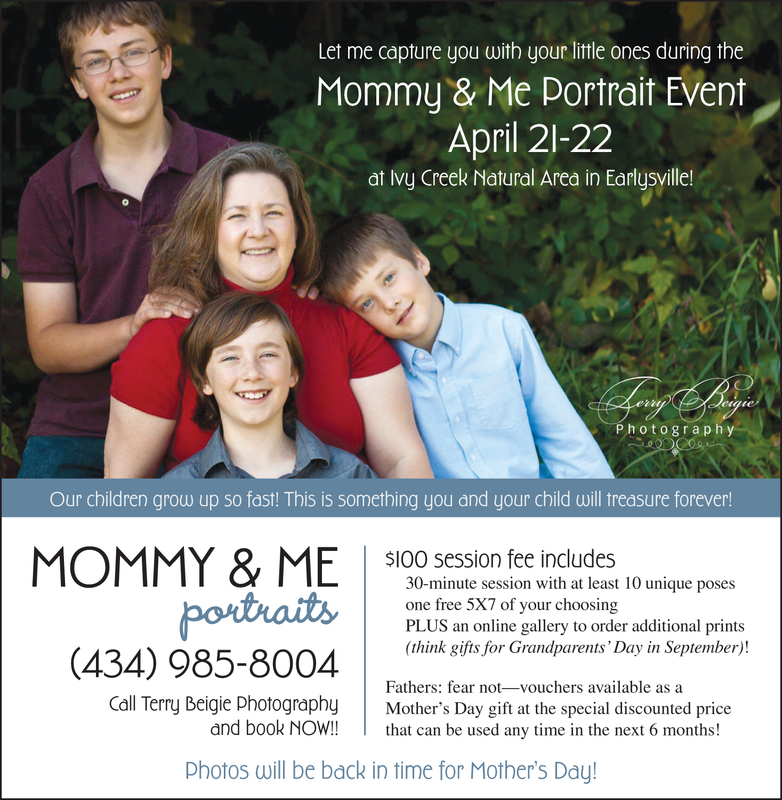 You can gift them to yourself, plan to gift them to a grandmother for Mother’s Day or include Grandma in the mini session, too! Get out from behind the camera and let me capture you with your little ones during the Mommy & Me mini sessions on April 21-22–photos will be back in time for Mother’s Day–at Ivy Creek Natural Area in Earlysville (large park with lots of areas to capture photos)! Included in the $100 session fee is the 30-minute session with at least 10 unique poses, one free 5X7 of your choosing and an online gallery to order additional prints–think gifts for Grandparents’ Day in September! Fathers: fear not–I have gift vouchers you can buy as a Mother’s Day gift for the special discounted price that can be used any time in the next 6 months!